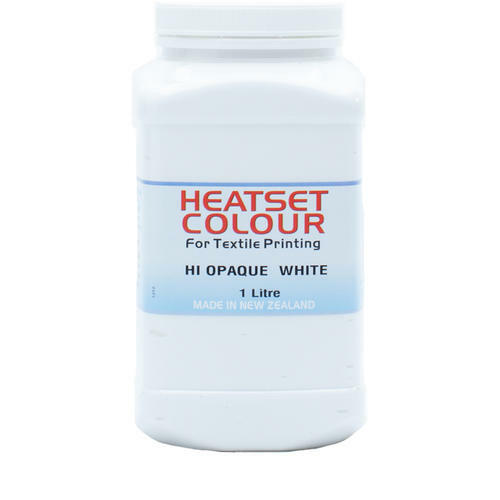 Heatset Hi Opaque White is water-based fabric colour most suited for the permanent decoration of cotton-based fabrics. Heatset Hi Opaque White will show best on both light and dark fabric. If application is to be on coloured fabric, the end result will be a blend of the fabric colour and the colour applied. Colours are intermixable and clean with water. They are not suitable to be used as a fabric dye in a dye bath. Heatset Hi Opaque White is best applied by screen-printing or hand painting. Use “straight from the pot” for screen-printing. If reduced viscosity is required for hand painting, add Heatset Handpaint Medium to reach desired consistency. Very highly pigmented, Heatset Hi Opaque White can be made less intense with addition of Heatset Print Paste. Heatset requires heat fixing to ensure maximum colourfastness when laundered. Colour must be dry before heat fixing. Use a hand iron on cotton setting (no steam) and heat for 3 – 5 minutes at 150 degrees C. For large areas it is advised to iron small areas at a time. 3 minutes at 180oC - for hand iron use cotton setting. Any form of dry heat will fix Heatset Hi Opaque White. Wash test to determine best time/heat cycle. IMPORTANT Before batch printing - TEST the correct fixing procedure by washing and rubbing the test print. Do not print onto "dressed" fabrics without first removing all the dressing. New fabric often contains “dressing” which can cause problems with uneven colour uptake and/or colour loss on washing. Dressing should be removed by washing thoroughly prior to decorating.